In 1990, the Goss Labor Government considered it appropriate that at least 50 per cent of North Stradbroke Island be declared national park. It did not happen. 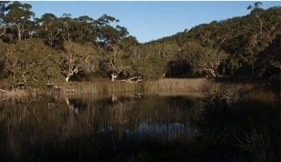 Less than 2% of the Island around Blue Lake - national park since the 1960’s- is protected. Over half of the Island is under mining lease, with the public excluded under threat of prosecution and mining destroying a valuable natural asset. Let’s stop mining before more of our island is gouged out. 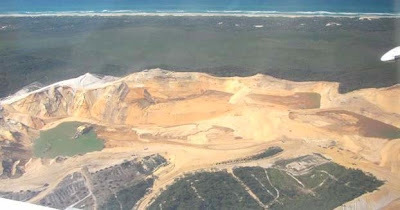 . . North Stradbroke Island mining operations from the air. (Photo courtesy of Peter W. Glynn. Photographer Terry Magee). Given greater Brisbane's need for more public green space and the fact that about 20 of the mining leases have expired or are due to expire soon, it makes sense to bring mining to an end and declare most of the Island national park without delay. Since 1990 the population of greater Brisbane has doubled. Government policy appears to support population growth at unprecedented rates, despite infrastructure struggling to cope. Premier Anna Bligh’s website recognizes the acute need for more national park and public green space – it records that greater Sydney has 49% public green space, while our area is only 19%. Even Melbourne far exceeds this with 33%. Declaring the Island national park will help redress this imbalance. An unprecedented opportunity exists – with mining leases that have expired, and more expiring soon. Renewal of the expired leases is being considered by the Government, which under the Mineral Resources Act can refuse to renew with no compensation payable to the mining company- Unimin Australia Limited, which is owned by a Belgian family through a US holding company. Two of the expired leases are very large - ML’s 1117 & 1121. Together they comprise 6,019 hectares. 1117 is the key lease. If it is renewed, ancient dunes and pristine old growth forests in the proposed path of the mine will be destroyed. By not renewing these leases the Government can also bring to an end costly litigation resulting from an appeal by the mining company against the unanimous decision of the Redland City Council in August 2008. The Council refused to permit the company to remove and sell to the construction industry an additional 500,000 tonnes of sand per year from these two leases. The Government has stated that it supports the Council’s decision. North Stradbroke Island is a standout option for national park because not only is it accessible to the largest concentration of Queensland’s population but, importantly, the Government already owns the land so there is no cost in buying it for national park. There is also an opportunity to give the Island’s indigenous population, many of whom have a 15-year-old unresolved native title claim, an opportunity to be employed and otherwise engaged in preserving and co-managing their traditional lands, as has occurred with national parks in the Northern Territory and north Queensland. Off limits ... mining leases restrict public access to places like this. It is almost universally recognized that nature based tourism is the future – yet mining continues to destroy this. Tourists are attracted to intact landscapes formed over many thousands of years. Some of the sand dune systems that mining completely destroys are 150,000 years old. Similarly, the complex vegetation and other ecosystems that took thousands of years to develop and which mining destroys are unlikely to ever be replicated. 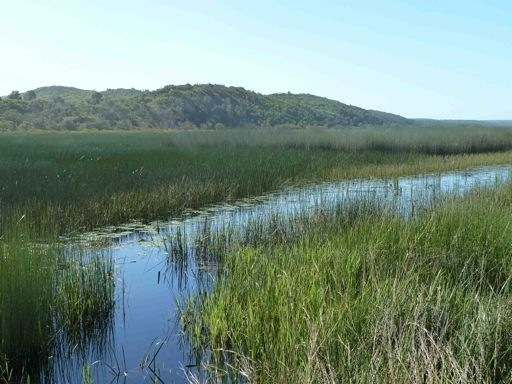 The Island has magnificent freshwater lakes and its wetlands are internationally listed. It is known for its wonderful and diverse array of flora and fauna. For example, the Island’s koala population is genetically distinct from the mainland koala and it is the only naturally-occurring Island population, making it unique. At least 244 bird species are known to either inhabit or visit the Island. In a pre-election letter to Island residents, Premier Anna Bligh indicated her Government believed that North Stradbroke Island..."should be protected and preserved for future generations". The mining company employs about 250 workers. Fewer than half live on the Island. By 2013, when one of the three mines is scheduled to close,about half of these jobs will go. The Island’s mines cannot be compared to the mines of central Queensland. Those mines employ many thousands and contribute vast sums to the State’s economy. Retaining mining on the Island makes little economic sense and the profits go overseas. The future value of North Stradbroke Island in terms of tourism and quality of lifestyle for Queenslanders - particularly those in the southeast- lies in protecting and preserving, not destruction. Mining usually provides transitory employment. But, acknowledging the employment issue, the Queensland Conservation Council and Tangalooma Resort management issued a joint media release last year supporting the establishment of an eco-resort adjoining national park on the Island. The Tangalooma resort employs between 300 and 400 people, depending on season. A state-of-the -art eco-resort on the bay side of the Island, with guests brought by boat (as occurs at Tangalooma) could be expected to triple the employment lost by ending mining with minimal impact on the Island's infrastructure. Declaration of the Island as national park would ensure its success. As national park, greater Brisbane’s very own ‘great walk’, running the 33 km length of the Island, is a real possibility. The government must 'think globally, act locally' by protecting the Island from further destruction and thus make a valuable contribution to the world's environmental challenges. Its time for national park - not mining- on North Stradbroke Island! The campaign for national park, not mining is supported by nine leading environmental groups. 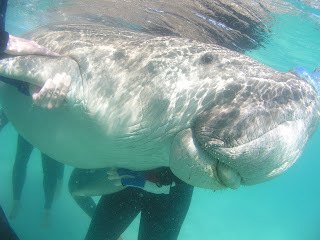 The Australian Marine Conservation Society and the Australian Conservation Foundation have recently joined with Friends of Stradbroke Island, Queensland Conservation Council, Community Alliance for Responsible Planning (CARP) Redlands, Fraser Island Defenders Organisation, Moreton Island Protection Committee, Wildlife Preservation Society of Queensland. An edited version of this article appeared in the Courier‐Mail recently.